“See what happens when you chow down on fast food every day?" One of the most popular acne myths out there is that greasy food = greasy face = pimples galore. While that’s actually not true at all, what you eat can affect your skin over all, so try to follow a healthy diet when you can. Whether you’re staying up to finish a game, or out all night with friends, or just silently holding vigil over your crush’s social media feed, be warned: sleep deprivation has been known to cause breakouts. Love seemingly causes all sorts of strange physical reactions, so we guess it’s no surprise that you’ll likely start sporting shiny red zits on your face right when you meet someone cute! Amazingly enough (or maybe not-so-amazing? ), getting in a relationship can cause you to breakout. That’s what happens when you start sharing pillows and towels and what have you with someone else! Like juicy burgers and salty fries, chocolates have gotten a bad rap when it comes to acne breakouts. But like the sitch with greasy food, it’s really more about you not eating healthily enough in general. 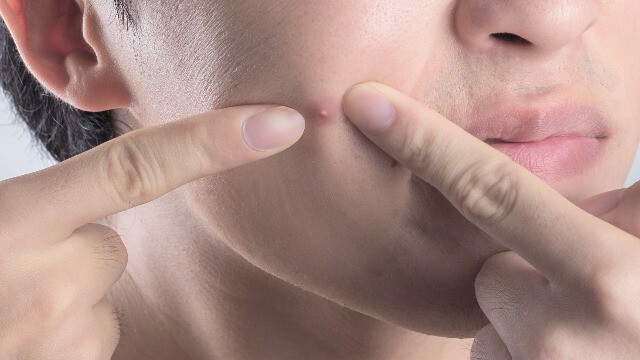 It’s a vicious cycle, really: your stress pimples will stress you out, resulting in more stress pimples! Ironically, while following a proper grooming regimen will keep the pimples at bay, washing your face too often with just regular soap can actually dehydrate your skin and lead to more breakouts. Don’t give your friends another opportunity to tease you by fighting acne before it becomes a problem! Make sure your face stays clean, hydrated, and pimple-free by using effective facial products like Master Deep Cleanser, which is formulated to clean your face more deeply than soap, ridding it of oil and dirt. ‘Eto ang sikreto ng mga gwapo!